BANGI, 21 July 2014 – Gelam honey, the product of a bee farm in Batu Pahat, Johore has been found to contain antioxidants that may help to reverse or at least slow down the aging process in rats. 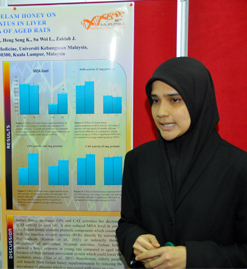 A group of final year medical students from The National University of Malaysia (UKM) doing research into the properties of Gelam honey concluded that the natural food modulated antioxidant enzymes in the liver of rats used in their tests. Rasheena said Gelam honey is a popular delicacy in Batu Pahat, where the bee farm had been producing the honey for many years. Different varieties of honey are produced by different species of bees. Gelam honey is known to have higher phenolic compounds which can reduce oxidative damage and may reverse the ageing process. The study was aimed at finding the effects of Gelam honey supplementation on oxidative status in the liver mitochondria of aged rats. Phenols are a class of chemical compounds consisting of a hydroxyl group(- OH) bonded directly to an aromatic hydrocarbon group. As they are present in food consumed in human diets and in plants used in traditional medicine of several cultures, their role in human health and disease has been a subject of research. Rasheena said the aging process is associated with imbalance between reactive oxygen species and antioxidants, leading to oxidative stress which causes oxidative damage, i.e. ageing. Two other team members Heng Seng Kee and Su Wei Lam did the testing using different honey extracts. Heng said the results showed that Gelam honey increased the activity of Glutathione Peroxidase or GPx – the general name of an enzyme family with peroxidase activity whose main biological role is to protect organisms from oxidative damage. She said the biochemical function of glutathione peroxidase is to reduce lipid hydroperoxides to their corresponding alcohols and to reduce free hydrogen peroxide to water. The other researcher Su said supplementation of Gelam honey seemed to have modulated the antioxidant enzyme activity in the liver mitochondria of both young and aged rats. However, the effect was more prominent in young rats. They used a total of 24 Sprague-Dawley rats in their research.